Want to win a free, 6-month online B2B lead generation campaign? T his afternoon, 451 Marketing officially announced the launch of the B2B Social Contest. The contest, open to companies that sell a business-to-business product or service, will award a free, 6-month online lead generation campaign (a $42,000 value) to the company that best articulates how and why social media will help its business grow. The contest will run from June 1, 2009 through September 1, 2009. B2B companies that wish to enter the contest must, in an e-mail, describe their company, its mission, product or service, what differentiates their company from competitors, and why and how they think social media marketing will positively impact their B2B business. Upon receipt, e-mail submissions will be posted on The B2B Social Contest Blog. Companies are encouraged to ask their clients, friends, and colleagues to comment on their company’s post. On September 1, 2009, 451 Marketing will tally the total number of comments each post received over the course of the 3 month contest. The five posts with the most comments will be considered finalists, and 451 Marketing will select the winner from this pool. If you have any questions about the submission, nomination or selection process, feel free to reach us at B2Bsocial@451marketing.com, or on Twitter (@451Heat). Thanks and good luck! Forrester Research recently released a report stating that 77 percent of technology decision makers (who make purchasing decisions on behalf of companies) use social media for business purposes. 77 percent is HUGE! So, you can assume that your prospective customers are active online. Don’t understand the chart? It’s ok. What it boils down to is that your prospective customers do participate in social media throughout the buying cycle. Some are more active than others, but the vast majority of decision makers are online. So, savvy B2B marketers should be online too. 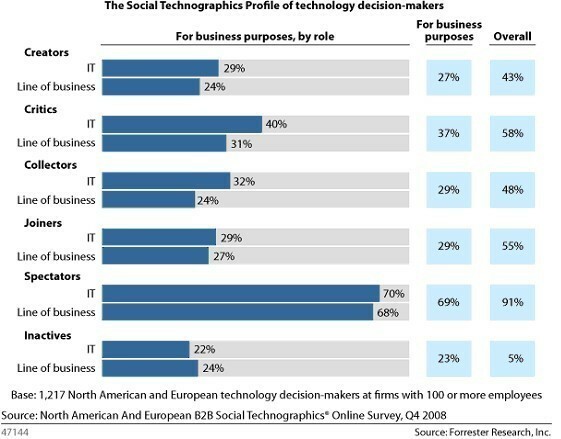 But, most B2B marketers are not effectively using social media to influence prospects’ purchasing decisions. Below, I explore some possibilities as to why B2B marketers are not using social media to promote their companies. Possible Reason #1 – Marketers think there is no way to develop B2B service business other than through referrals. In the olden days of marketing (just two or three years ago! ), B2B businesses increased sales primarily through referrals, but the playing field has changed. Or, more specifically, the way people communicate has changed. Today, people communicate through traditional channels like over the phone, and they talk via email, on blogs, in online forums, and through their social networks (how many groups do you belong to on LinkedIn?). B2B marketers can benefit from this change in communication behavior by working with an agency like ours that uses advanced technologies to monitor the millions of conversations taking place online and identify prospects that are in need of your services in real time. New media technologies also enable us to engage your prospective customers in conversation through their preferred social media channels, which they use to communicate with their peers and look for solutions to their business problems. Being able to monitor millions of online conversations simultaneously is extremely helpful in developing new business leads. It’s like going to a business networking event with millions of attendees and monitoring every conversation in the room at the same time for prospects in need! Everyday, thousands of your ideal B2B prospects/targets are expressing their needs for solutions to their business pain points through social channels. You can generate and nurture new business leads if you have a protocol in place for identifying prospective clients, engaging them in conversation, and offering content that positions you as an expert and helps to solve prospects’ problems. Possible Reason #2 – It’s too difficult to prove ROI with social media. ROI can be measured! The way we measure ROI from social media for all of our B2B clients is by the number of quality leads generated – ‘Nuff said! We successfully generate new, quality leads by strategically executing campaigns that involve leveraging social media technologies and search marketing strategies. These campaigns also involve engagement protocol development, engagement through social channels, content development (white papers, webinars, podcasts), extensive monitoring of the social Web (using tools like radian6), landing page development, possible CRM integration, and drip marketing planning. Possible Reason # 3 – B2B sales are too complicated to take place via social media or a social media agency. First of all, social media is not a tool for closing business deals, so don’t think of it in that way. Instead, social media is a tool for listening, identifying prospects’ pain points, creating awareness of your brand and the benefits you offer, expert positioning, engagement, and lead-generation. Second, just because there are very few social media agencies that have expertise in B2B marketing (our agency is one of the few that focuses on B2B), this doesn’t mean they don’t exist. If you are a B2B marketer looking to execute a social media campaign, you need to find a social media agency that understands the complexities of the B2B sales cycle, and the sometimes difficult B2B buyer. Now, I would like to hear from you. Why do you think so few B2B marketers incorporate social media into their business lead generation initiatives?